As a crowd of 3,000 watched the sellout women’s basketball game between the University of Connecticut Huskies and the Duquesne University Dukes from the stands at the Mattamy Athletic Centre, a dozen RTA sport media students were watching a slightly different version from the state-of-the-art production studio a few floors up; their view was of an intricate web of monitors, with each shot on the screens carefully framed by a student cameraperson on the court below. Rather than a stationary view from one of the arena’s seats, the students in the studio watched the game unfold with a 360-degree view, able to rewind, fast-forward and zoom in on the action below. 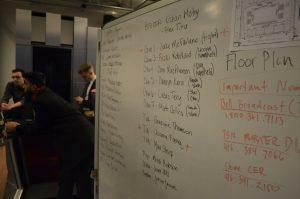 The smell of leftover fries wafted through the dimly lit studio as a chorus of broadcast lingo bounced back and forth. “Lose the tape!” “Cut to black!” “Add the fonts!” Between each pair of headphones was a set of bright eyes glued to the glowing screens, carefully watching for the next camera switch or game-changing play. The details of the broadcast had to be planned out to the second, because once a mistake is made on live television, it can’t ever be fixed. Especially when it’s being broadcast nationwide. And especially when it’s being broadcast on TSN. 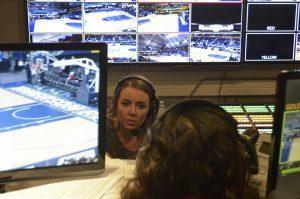 Not only was the game between UConn and Duquesne the culmination of a fourth-year RTA practicum project, it was the first student-run production to be shown on “Canada’s Sports Leader.” The students’ work was live streamed on the TSN GO app, and shown on TSN2 the next afternoon. By the time the program concluded, over 14,000 viewers had tuned in. Every shot, every sound-bite, every graphic—every little thing that popped up on the screen— was orchestrated by a team of 30 RTA students and volunteers. Practicum projects are stressful enough when they’re being shown to a professor and classmates. This one was being beamed out to the rest of the country, and could serve as a launchpad for their careers. Each fall semester, fourth-year RTA students do a months-long practicum project that puts all their previously learned skills to the test. So when September rolled around, Mitch Robson and Jordan Henry, roommates who are both part of the first graduating class of RTA sport media students, were faced with this daunting challenge. 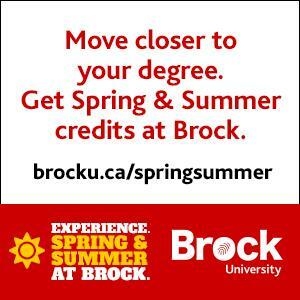 The duo is part of a small and rare group of university students— those who pay $180 a month for cable television. As sports fanatics, sport media students, and lovers of broadcast television, they see it as their duty to give back to their field. For hours at a time, their shared apartment will have three screens playing three different games, because god forbid they fall victim to the one-and-a-half minute lag that comes with online streaming. They’ll avidly watch anything from the NBA to the NCAA, so when they saw a post in an online forum about one of the best female basketball players in the collegiate league, they knew they had found the inspiration for their project. 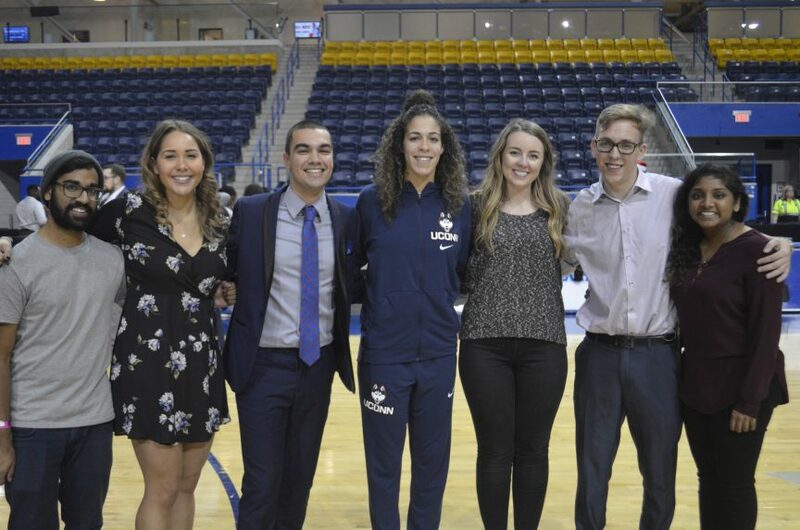 The post read that the Mattamy Athletic Centre would host a game between the University of Connecticut and Duquesne University in honour of Kia Nurse’s homecoming. Nurse, a native of Hamilton, Ont., is now in her last year at UConn and is one of the top point guards in her league. At UConn, each player in her final year gets a homecoming game in their hometowns, or as close to them as possible, so they can play with family and friends in the crowd. Hamilton’s FirstOntario Centre was already booked for the IIHF World Junior Championships, so the MAC was the next best option, since Nurse had previously played there when she helped Canada win gold at the 2015 Pan Am Games. 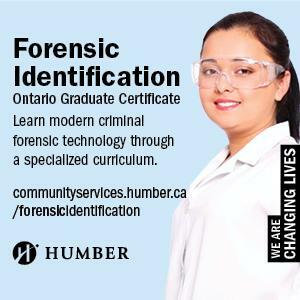 In June 2017, before their fourth year even started—and before their idea was approved by their professors—Henry and Robson reached out to Paul Graham, a friend’s father who was a producer at TSN. Graham was supportive of the idea, and Henry and Robson gathered a team of four other RTA students—director of photography Kishan Mistry, broadcast producer Keerthika Uthayakumar, director Kayla McLean, and production coordinator/colour commentator Jaime Hills—to form Backdoor Cut Productions over the summer. 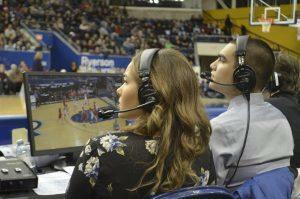 Backdoor Cut Productions, a student-run media production company, got its name from a Ryerson basketball game recap blog Robson and Henry started in their second year. 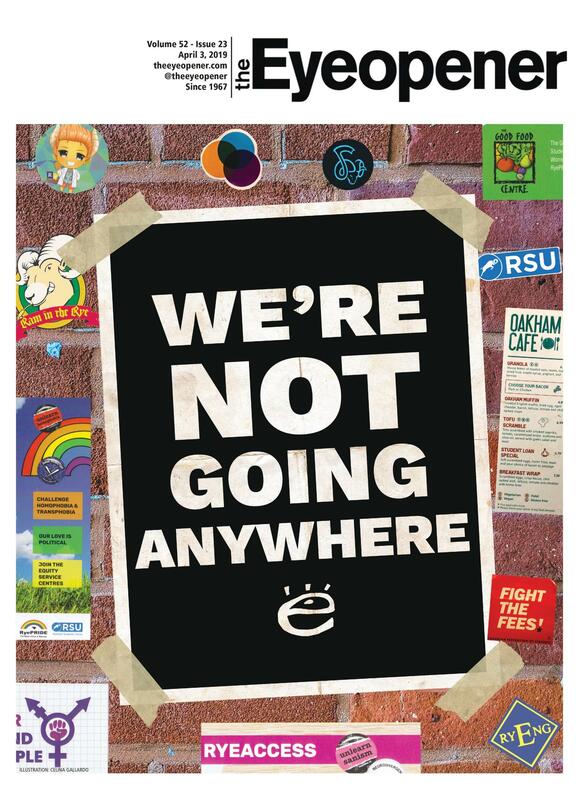 “It was kind of a bold call on our part, putting all of our eggs in one basket and doing five months of pre-planning,” said Henry, Backdoor Cut’s executive producer. When the time came to pitch their practicum to a panel of professors and industry professionals, the team was well-prepared, and in their class of 65 students, their pitch was one of nine that got the green light. The group decided to produce a documentary series leading up to the game in addition to the broadcast. The series focused on Nurse’s basketball career in Canada and the U.S., and on the Huskies and Dukes. Creating the series involved hundreds of emails to schedule interviews, a 10-day road trip to the United States, and over 2 terabytes of footage—equivalent to nearly 8 iPhones Xs at maximum data capacity. “We went down in the middle of November and it’s been pedal to the floor ever since we got back,” said Henry. With a $5,000 sponsorship from BioSteel, a Canadian sports drink company, to fund their production and travelling costs, the group managed to film 75 per cent of their interviews on their trip through Connecticut and Pittsburgh, where they visited both universities as well as the Bristol, Conn., headquarters of ESPN. At ESPN, on-air host Adnan Virk gave them a tour of the building and sets, including the cafeteria, where former NFL player Booger McFarland bought everyone a bottle of Vitamin Water. In between interviewing Nurse, her teammates and coach, Backdoor Cut Productions made sure to watch “The Haunting in Connecticut” during their four days in the state. With a stop in Hamilton to interview Nurse’s family and one in Detroit to interview her brother, the group quickly gathered the footage they needed to start producing the five to 10-minute documentary episodes. He was more than happy to help out—after all, he remembers his days as an RTA student, working on his own practicum project. Baluyot had worked with a few of the Backdoor Cut members when they’d previously volunteered for broadcast projects, so he knew what they were capable of doing. He also knew he didn’t have to treat the students any differently than he would a regular co-worker. 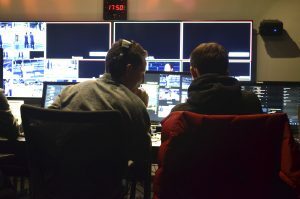 Backdoor Cut enlisted the help of over 30 student volunteers on production day, many of them fellow RTA students with broadcast production experience from Rams Live—a program that covers Rams varsity athletics on live television, webcasts, and radio. With the game being just three days before Christmas, the volunteers who went back home for the holidays came back just to help out. Not only did second-year sport media student Graeme Thomson travel from Guelph to help the camera crew as a television assistant, he did it just a few days after getting all four wisdom teeth removed. Thomson showed up on Friday morning with his applesauce, liquid meal supplements, and a pill bottle of antibiotics and painkillers, ready for the long day ahead. “Doing something on TSN is definitely worth it, because everything has to be polished and professional to be able to go on a nationally broadcast channel, so that’s definitely the main reason why I came back,” he said. On game day, each member of Backdoor Cut played an integral role. On the courtside, in their spiffy, camera-ready suit and dress sat Robson and Jaime Hills. Robson was the play-by-play commentator while Hills, with her past experience as a Rams basketball player and an OUA championship title under her belt, was the colour commentator. The two had watched every Dukes and every Huskies game leading up to that night, and made sure the long, European last names of the players (like Vojinovic and Staffileno) were well-practiced and well-pronounced. The conversation between Robson and Hills flowed freely; the momentum mirrored that of the fast-paced game just meters away. Kishan Mistry, the director of photography, ran around shooting footage of the game for the group’s last documentary episode, sprinting up to the studio every so often to change his lens. From his vantage point at the back of the production centre, Henry oversaw his crew and made sure everything went smoothly—like a professor watching his students during an exam—while Kayla McLean, the director, worked from the front desk. Broadcast producer Keerthika Uthayakumar, whom everyone calls “Keeks”, did not sit down once during the entire game. She originally intended on staying seated, but as soon as the anthem started—two minutes early because the clocks in the arena and the production centre were mismatched—she was on her feet and ready to tackle any other problems that came her way. The game flew by in a blur, and in a mere hour and 20 minutes, UConn defeated Duquesne by a score of 104-52. Shortly after that, the screen went to black for the last time, and Uthayakumar was finally able to take a seat—after she made sure to hug and thank every person in the room, of course. 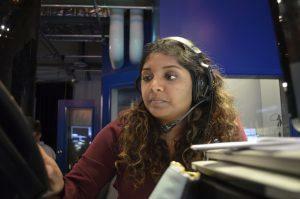 When Uthayakumar first started working in broadcast television, someone told her that if she ever had a perfect show, her next move should be retirement. In live sports, Henry said, there is no such thing as a perfect show. But, for Backdoor Cut Productions, that night at the MAC came pretty close. “It’s nice to see that the future of sports television production is in good hands. They all love the craft of television production and veterans like myself are extremely happy seeing what they’re bringing to the table now,” said Baluyot. After months of prep, hundreds of kilometres on the road, and countless hours of editing, their project—that had grown bigger than any of them could have ever imagined—was complete, save for one last documentary episode. “We’re a group of students, who haven’t graduated yet, who just produced a game for national television in Canada,” said Henry.